I've gotten a few more short row "wedges" done on the Ravi cardigan's yoke. I think (I didn't check my notes on the pattern), but I think I'm about halfway done with these. Each little wedge section doesn't take too long, but I don't want to stop mid-wedge, so I'm only picking it up when I have a little chunk of time to knit. Also Max REALLY seems to like Socks That Rock yarn. So I have to have time for at least one wedge plus cat removal as well before I pull this project out. This is also the one thing I'm knitting that doesn't have a time limit on it - Camp Loopy and my Knit Something of the Month project both have time limits, so this one can go to the bottom of the basket if I need it to. Speaking of time limits, July 27 is the Opening Ceremonies for the Olympics and cast on for the Ravellenic games. It's also cast on day for Camp Loopy project 3. I have until August 27 to finish the Camp Loopy project, but only about two weeks to finish the one. I'm considering either skipping August for my Knit Something of the Month project or bumping that project from August to Whenever I Have A Chance and just work it in later. I know I'm going to have other things going on in August as well and I think this might be my best chance to stay sane. Still thinking about it, and if things are going well, I can always start it after the Ravellenic games are over. Whether I do it or not, this is turning out to be a pretty productive summer! That looks lovely. The color is calling to me! I'm amazed at how many things are flying off your needles. 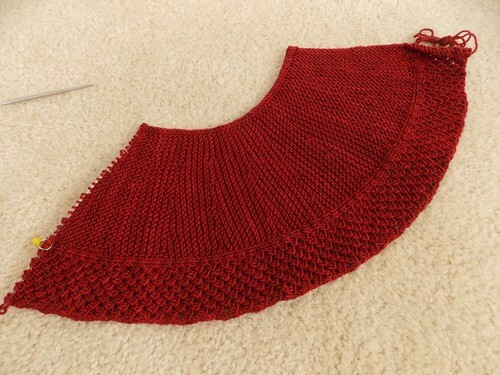 I too started Ravi last month between Camp Loopy Projects (although I signed up back in May for this KAL). I got halfway and need to finish Project 2 so I can get back to Ravi and get caught up. Beautiful color! Can't wait to see what it looks like! I just read an article about the argument between Ravelry and the Olympic committee and them voting to make ravelry change their name for the Olympics. So sad, and such a bunch of "stuffed shirts."